The Blithbury Summerhouse is a beautiful garden building - the ornately styled windows and doors create a unique look, complimented by the antique door furniture. 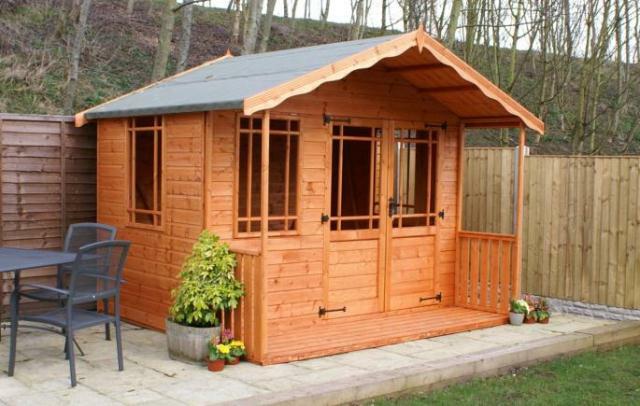 This beautiful summerhouse comes with a 1ft canopy over the front as standard, which can be upgraded to a full veranda if desired to create a space to relax outside, or an area for your garden plants. Larger models feature double doors as standard, for ease of access and to let even more light into the building. The Blithbury Summerhouse 10'x10' (3.04m x 3.04m) is a stunning addition to any garden, great for home entertaining, with full length Georgian windows and double doors on the front. Fully installed if you are located in the green zone. The Blithbury Summerhouse 10'x14' (3.04m x 4.26m) is a stunning addition to any garden, great for home entertaining, with full length Georgian windows and double doors on the front. Fully installed if you are located in the green zone. The Blithbury Summerhouse 12'x10' (3.65m x 3.04m) is a stunning addition to any garden, great for home entertaining, with full length Georgian windows and double doors on the front. Fully installed if you are located in the green zone. The Blithbury Summerhouse 12'x14' (3.65m x 4.26m) is a stunning addition to any garden, great for home entertaining, with full length Georgian windows and double doors on the front. Fully installed if you are located in the green zone. The Blithbury Summerhouse 14'x10' (4.26m x 3.04m) is a stunning addition to any garden, great for home entertaining, with full length Georgian windows and double doors on the front. Fully installed if you are located in the green zone. The Blithbury Summerhouse 14'x12' (4.26m x 3.65m) is a stunning addition to any garden, great for home entertaining, with full length Georgian windows and double doors on the front. Fully installed if you are located in the green zone. The Blithbury Summerhouse 14'x14' (4.26m x 4.26m) is a stunning addition to any garden, great for home entertaining, with full length Georgian windows and double doors on the front. Fully installed if you are located in the green zone. The Blithbury Summerhouse 5'x10' (1.52m x 3.04m) is a stunning addition to any garden, great for home entertaining, with full length Georgian windows and double doors on the front. Fully installed if you are located in the green zone. The Blithbury Summerhouse 5'x12' (1.52m x 3.65m) is a stunning addition to any garden, great for home entertaining, with full length Georgian windows and double doors on the front. Fully installed if you are located in the green zone. The Blithbury Summerhouse 5'x14' (1.52m x 4.26m) is a stunning addition to any garden, great for home entertaining, with full length Georgian windows and double doors on the front. Fully installed if you are located in the green zone. The Blithbury Summerhouse 6'x10' (1.82m x 3.04m) is a stunning addition to any garden, great for home entertaining, with full length Georgian windows and double doors on the front. Fully installed if you are located in the green zone. The Blithbury Summerhouse 6'x12' (1.82m x 3.65m) is a stunning addition to any garden, great for home entertaining, with full length Georgian windows and double doors on the front. Fully installed if you are located in the green zone. The Blithbury Summerhouse 8'x10' (2.43m x 3.04m) is a stunning addition to any garden, great for home entertaining, with full length Georgian windows and double doors on the front. Fully installed if you are located in the green zone. The Blithbury Summerhouse 8'x12' (2.43m x 3.65m) is a stunning addition to any garden, great for home entertaining, with full length Georgian windows and double doors on the front. Fully installed if you are located in the green zone. The Blithbury Summerhouse 8'x14' (2.43m x 4.26m) is a stunning addition to any garden, great for home entertaining, with full length Georgian windows and double doors on the front. Fully installed if you are located in the green zone.